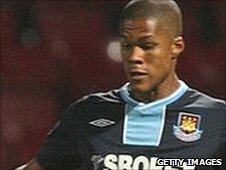 Bristol City have signed West Ham right-back and England Under-19 international Jordan Spence on loan. The 20-year-old has made one substitute appearance for the Hammers but has had first-team experience on loan at both Leyton Orient and Scunthorpe. City hope to extend the initial one-month deal to the end of the season. In the absence of captain Louis Carey, who has been filling in at right-back in recent games, Spence is set to start at Coventry on Saturday. "I don't think anywhere's easy to go but I'm prepared for it and will give it a go," Spence told BBC Radio Bristol after training with the City squad for the first time on Thursday morning. "I was hoping somebody would come in for me so I've been ready and preparing myself physically and mentally for the opportunity. "I'm here to play and do well for Bristol City first and foremost, and then the experience and where that takes me will be a positive thing as well. "I operate at right-back or centre-half. I'd like to say I'm a composed defender, I've obviously been brought up playing football at West Ham, and one of my key attributes is that I'm quite quick, I'm decent across the grass and I look to get forward when the time's right." Carey, 34, fractured his skull in the home win against Scunthorpe on Saturday and the injury is worse than was first thought with the skipper potentially missing for the rest of the season. "Louis will be out for at least six to eight weeks," manager Keith Millen told BBC Radio Bristol. "It's an injury we can't take any chances on and we have to respect what the specialists are saying. It's going to be a long time before he's allowed any contact in football, so we're all disappointed. "It leaves us short but we've kept an eye on Jordan for a while now. "We watched him in West Ham's reserves, he has Championship experience playing 11 games for Scunthorpe and we've done our homework, speaking to a lot of people. "He's a great lad and he wants to learn and improve his game. He's a good athlete, quick and strong, and a good size and is a good addition to the squad. He looked decent in training."